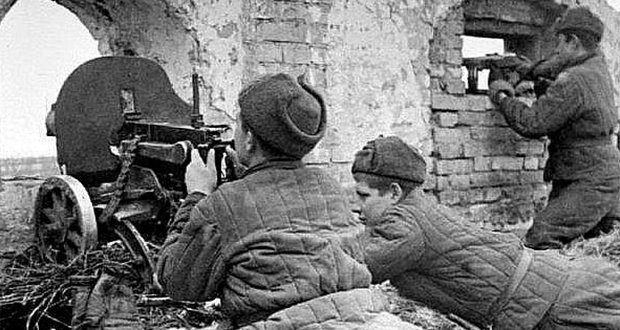 In Stalingrad during World War 2, the average life expectancy of a Soviet soldier was 24 hours. 2. During WWII, L Ron Hubbard once led a 68 hour battle against two Japanese submarines which he claimed: "definitely sunk, beyond doubt". An analysis later concluded that there were never any submarines in the area. 4. 18th Century Norwegian swashbuckler Peter Tordenskjold once ran out of ammo during a sea battle so he sent his enemy a letter thanking him for "a fine duel" and asking him to send more ammo so they could carry on. The two crews then toasted each other's health and went their separate ways. 5. A German lieutenant, Friedrich Lengfeld, was killed by a land mine while attempting to rescue a wounded American soldier during the Battle of Hürtgen Forest in WWII. The Americans erected a monument in his honor; the only American monument placed in any German military cemetery. 7. In 1818, an Englishman accused of murder demanded a trial by combat. Surprisingly, the law that allowed for trial by combat was still valid, and the man was acquitted when his accuser declined the offer of battle. Trial by combat was abolished the following year. 8. The Aztecs regarded childbirth as a form of battle. Women who died during childbirth were thought to rise to one of the highest heavens - the same one as for male warriors who died in battle. 9. King Leonidas of Sparta was 60 years old at the Battle of Thermopylae. 10. Kurt Lee, the first Chinese-American US Marine Corps officer, yelled out orders in Mandarin Chinese to confuse opposing Chinese troops during the Battle of Inchon in the Korean War. On August 1, 1946, in Athens, Tennessee, battle-hardened WWII veterans won a shootout with highly corrupt police deputies who were manipulating ballots and illegally holding ex-GIs in the county jail. 12. During a battle Genghis Khan was shot in the neck, after the battle he asked the defeated who shot him, Zurgadai confessed to shooting him but refused to beg for mercy. Genghis Khan then made him one of his troops and eventually he went on to become one of his high ranking generals. 13. In Ancient Rome a slave would continuously whisper 'Remember you are mortal' in the ears of victorious generals as they were paraded through the streets after coming home, triumphant, from battle. 14. The aircraft carrier USS Yorktown was heavily damaged after destroying a Japanese aircraft carrier during the first carrier battle in history. After 48 hours of emergency repairs, it ended up helping destroy two more carriers before being sunk and inadvertently saved the other US carriers. 15. During a battle of the Korean War, a mortar section was running out of mortar rounds. Instead of ordering more rounds, they accidentally ordered hundreds of crates of Tootsie Rolls, having not specified that "tootsie rolls" was a slang term for mortar rounds. 17. As the strongest and most imposing members of a company, British Pioneer Sergeants would march with a shovel and axe to clear a path for troops, kill horses wounded in battle, and grow beards for protection while smithing. 18. The Mad Piper Bill Millin, the only bagpiper to land on the beach in Normandy. While men fell around him, he played his pipes throughout the battle. A group of captured German snipers was asked why they hadn't shot him. They replied that they thought he'd gone insane and felt bad for him. 19. During the Battle of Moscow, despite German forces closing to within 50 kilometers of the city, the Soviet Union still held the annual military parade marking the revolution. Soviet troops who paraded past the Kremlin then marched directly to the front line and into battle. 20. During The Battle of The Bulge, General Patton ordered a chaplain to compose a prayer for good weather that was desperately needed for an advance. The chaplain complied, the weather cleared, and Patton awarded the chaplain a bronze star on the spot. 23. During the Battle of Stalingrad, factories in the city continued to produce tanks. These tanks, unpainted and lacking gunsights, were driven directly from the factory floor to the front line and were often crewed by factory workers. 25. Begum Samru (1753-1836), an Indian dancing girl who became the wealthy ruler of her own small principality. She led her troops into battle and was so successful that many believed that she had supernatural powers. After baptism, Samru became India's only Catholic ruler.